Lyft device combines several functions for a painless and effective method of stimulating dermal activity that is easy to use. And with the micro-vibration technology it gives your skin a massage to thighten, smoothing and rendering a soft radiant glow. You can also it under the eyes. The device looks like a bit similar to the Project E Beauty LED 3 Colors and Massager device. 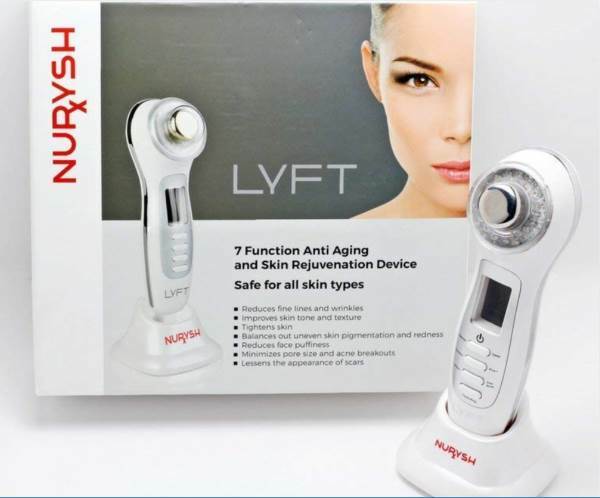 But his LYFT device does more due to the BIOWAVE and galvanic features "to tighten collagen fibers to improve facial texture and to pull debris out from deep in your dermis", says the company. The BIOWAVE technology is not the same as the Radio Frequency technology. THe functions are indicated on te device. For Cleansing, Nutrition, and Face Lifting functions you can use this device daily. The photo rejuvenation therapy - red and blue lights - is recommended to use three times a week if you have a sensitive skin. You can use the device also for neck, decollete or other body parts. You can use Hyaluronic Acid during nutrition, nutrition plus, face lifting, and the red light mode of this device. Power: AC100-240V. Unplug the device from the power cord after charging, and use it wirelessly. The device comes with protective goggles. For the LYFT massage and Light Therapy Treatment device, see Amazon Here for best pricing, info and reviews. Sirius Nova - This newly developed 4-in-one led light therapy system for use at home, features treatments heads - interchangeable - to use for treating hyperpigmentation, acne and skin aging, but also a treatment head for cleansing, toning and lifting your skin. Silk n Facefx - Review and Info on Silk n Facefx fractional red light therapy together with deep thermal heating, supporting collagen production and achieving long-term, radiant skin. Quasar MD PLUS - Info on the Quasar MD PLUS bringing you the most powerful wrinkle-reducing technology ever used before in the Quasar family. Improved over previous models, this new device is easier to use, more powerful, and now includes perioribital wrinkle reduction technology, says the company.